The BJP has promised to restore the glory of “Queen of Hills” and solve all its problems, which have aggravated allegedly due to non- performance of the Congress-ruled Municipal Corporation over the past 16 years. Himachal Pradesh is heading for a water crisis this summer as many areas have already started feeling the pinch of water scarcity. Reports of a fall in the level of the water supply schemes in Hamirpur, Bilaspur, Mandi, Kangra, Una and Sirmour districts have started pouring in. The traditional sources of water have started drying up because of the dry spell and inadequate rain during the winter. The government has earmarked 50 lakh tonnes of foodgrain worth Rs 5,000 crore for distribution among the states free of cost for the current fiscal year under the Prime Minister’s Rural Employment Scheme. The information was given by Mr Shanta Kumar, Union Minister for Consumer Affairs and Public Distribution, while talking to mediapersons here last evening. Perturbed over reports of alleged conversion, over a dozen Hindu organisations under the banner of the Hindu Suraksha Manch, today threatened that they would not allow the Christians’ conference to be held in Kangra town. 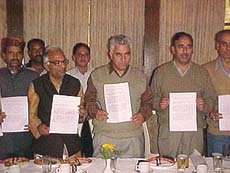 The Him Loktantrik Morcha has charged the Deputy Commissioner, who is also the returning officer for the Shimla Municipal Corporation poll, with manipulating the electorals to suit the interests of the ruling BJP, and decided to lodge a written complaint with the state Election Commission regarding the gross irregularities committed in preparing the final voter list. The PCC Chief, Ms Vidya Stokes, today lashed out on the Deputy Commissioner, Shimla, for not releasing the voters’ list of the local Municipal Corporation although only two days were left for the election for the civic body. Sinking their differences on the eve of the municipal corporation elections, the CLP leader, Mr Virbhadra Singh, and the PCC chief, Ms Vidya Stokes, today held their first public meeting together and sought votes for the Congress nominees to retain control over the civic body. Mr Virbhadra Singh and Ms Stokes shared the dais and will address another public meeting tomorrow at the sabzi mandi ground. The Chief Minister, Mr P. K. Dhumal, said today that the “patch up” between the PCC Chief, Ms Vidya Stokes, and the CLP leader, Mr Virbhadra Singh, on the eve of the election for the Shimla Municipal Corporation would hardly have any impact on the people. Expressing concern over the well-being and safety of Gedhun Choekyi Nyima, who will turn 13 tomorrow, various Tibetan organisations today demanded that if China had nothing to fear from the Panchen Lama, then he should be set free so that he could undertake his religious studies. The 187th Rising Day of the first Gorkha Rifles was celebrated with fervour and gaiety today at the 14 Gorkha Training Centre, Subathu, about 25 km from here. Traditional tributes and homage were paid to the gallant soldiers of the regiment who had made the supreme sacrifice by laying down their lives in various battles in keeping with the regimental motto, “Kayar hunu Bhanda marnu ramro” i.e. it is better to die than be a coward. Members of the Himachal Pradesh HRTC Drivers Union has alleged that they are being meted out “inhuman and discriminatory treatment” and have threatened to take an “extreme step” if they do not get justice. The Lambagaon police found the mutilated body of Meera Devi (24) hanging from a tree in a forest near Kosari, about 10 km from here, today. According to the police, she had been missing from her in-laws house since March 10. Search operations for the missing British paraglider intensified with the help of ITBP rescue-teams. The BJP has promised to restore the glory of the “Queen of Hills” and solve all its problems, which have aggravated allegedly due to non-performance of the Congress-ruled Municipal Corporation over the past 16 years. The election manifesto for the corporation poll released here today by Mr Jaikrishan Sharma, state BJP chief, covers issues ranging from water shortage to the takeover of the historic Annandale ground which has been hanging fire for the past decade. Mr Suresh Bhardwaj, convener of the manifesto committee, said the document had been prepared after consultations with the residents. He said unlike the Congress, which failed to fulfil a single promise made in its manifesto, the BJP would implement its manifesto in toto. He said the BJP government had adopted its manifesto for 1998 assembly poll as a policy document soon after assuming office and it had been implemented even before the completion of its five-year term. Besides ensuring water supply twice a day, the party has promised to start the process for regularisation of “dharas” and provide them water and power connections. Construction of five-storey buildings would be allowed and the building plans of those who had acquired plots in the banned core areas will be recommended to government for sanction. The annual lease of old stalls would be converted into long-term lease and new stalls leased out only on mid or long-term basis. A onetime settlement scheme would be framed clear all the pending building plan cases and new cases approved within three months. The building plans for reconstruction of old structures would be sanctioned within a month. The party has also promised to construct labour hostels and community halls in various parts of the city. Forest areas close to residential localities would be fenced to protect people from wild animals. Musical fountains would be set up to attract tourists. The local residents would be provided car-parking facility at subsidized rates and multistoreyed parking lots constructed. Commercial complexes would be built at Sabzi Mandi, Anaj Mandi and other places to provide avenues of self-employment. Other points included development of an international cricket stadium at Annandale ground, beautification of Rani Jhansi Park and construction of flyovers to end traffic congestion. An advisory committee comprising persons from different walks of life would be set up to guide the corporation and each councillor would hold “Nigam Aap Ke Dwar” meetings every three months to solve problems of residents on the spot. However, a respite came today as many areas had a rainfall. The situation was worst in Mandi, Hamirpur and Bilaspur districts where 25 to 50 per cent water has dried in at least 97 water supply schemes. About 290 water supply schemes in Hamirpur and Bilaspur have been affected due to the shortage of water. Reports indicated that 0 to 25 per cent water depletion has been recorded in 185 water supply schemes in these three districts. Depletion of 25 to 50 per cent water has been noticed in 54 water supply schemes of Mandi, 15 in Hamirpur and 10 in Bilaspur. As many as 89 drinking water supply schemes in Bilaspur, 60 in Hamirpur and 36 in Mandi have shown a downfall of about 25 per cent in the water level. Sources said there had been a fall of about 10 per cent in the water level in the supply schemes of Mandi, Sarkaghat and Sundernagar towns. With all these reports pouring in, it is expected that Himachal Pradesh might face a severe water crisis in case the dry spell continues. Most of the schemes in the state are based on rainfed catchments. However, senior officers of the Irrigation and Public Health Engineering department claimed that the decline in the water level was not alarming and the situation had not come to deploy water tankers. Changar, Thural, Nagrota Surian and Trilokpur in Kangra district have started feeling the pinch of water scarcity. Chamba was also facing problem because of isolated rain. A note of caution came from the Chief Minister, Mr P. K. Dhumal, in the Una district on Sunday where he said the ground water level had dropped because of meagre rain and this might cause a water scarcity during the summers. He said the government was making arrangements to provide adequate drinking water, but the people should not misuse it. The chief engineer of the IPH (north zone) was leaving for Una to personally examine the situation there. The water requirement during summer in Shimla was about 72 lakh gallons against which only about 58 lakh gallons was available. However, the authorities were hopeful that the situation might not be so bad this time as the central groundwater board had drilled a tube well at Ashwani Khad to provide an additional 4 lakh gallons of water. This scheme was constructed during the British regime in 1875 and was augmented from time to time. A sum of Rs 40 crore was sanctioned by the 10th Finance Commission in 1996 for the improvement of the water supply and sewerage system of the town. The government has earmarked 50 lakh tonnes of foodgrain worth Rs 5,000 crore for distribution among the states free of cost for the current fiscal year under the Prime Minister’s Rural Employment Scheme (PMRES). The information was given by Mr Shanta Kumar, Union Minister for Consumer Affairs and Public Distribution, while talking to mediapersons here last evening. He said this foodgrain was meant for food-for-work programme. He pointed out that the Union Government had exported 86 lakh tonnes of foodgrain for the first time and earned a foreign exchange of Rs 4,000 crore last year but now a target had been fixed to export 150 lakh tonnes in the current year to earn a foreign exchange of Rs 9,000 crore. He further revealed that the government had decided to distribute 462 lakh tonnes of foodgrain through the public distribution system in the country which would cover Antodya, below and above poverty line families who would get the same quantity of foodgrain at different rates. Mr Shanta Kumar said there was no dearth of storage capacity in the country for the current year’s procurement of foodgrain. He said the Union Sports and Youth Affairs Minister, Ms Uma Bharti, would lay the foundation stone of Rs 2.10-crore Saurav Van Vihar at Palampur being set up in the memory of Major Saurav Katia who had laid down his life in the Kargil sector during Operation Vijay. He said this project was being developed as unique tourist spot in the state which would have a modern swimming pool. Mr Shanta Kumar also visited the Chogan area where 11 kiosks were reduced to ashes in a fire on Sunday and expressed sympathies with the victims. He assured them that he would take up the issue of their rehabilitation with the Chief Minister, Mr Prem Kumar Dhumal. Resentment has been brewing, especially among these Hindu organisations, over the holding of a “Sukhdayak sammelan” by the Christian Missionaries from Coimbatore in Kangra from May 5. “Come what may, we shall not allow the exploitation of the poor Hindus by the Christian missionaries, whose real motive is to convert by offering them monetary help,” said an indignant Dr Gulshan Kumar. Dr Kumar is the state president of the Shiv Sena and convener of the Hindu Suraksha Manch, floated to “protect” the Hindu dharma. Addressing a press conference here today, heads of various Hindu organisations like the RSS, Shiv Sena, Hindu Mahasabha, Arya Samaj, Sanatan Dharam Sabha, Jain Samaj, Jat Kalyan Parishad, Hindu Kalyan Parishad, Vishva Hindu Parishad, Seva Bharti, Valmiki Samaj and Gayatri Parivar, said if the situation turned violent, the responsibility would lie on the district administration and the organisers of the Christian Conference, as they had already asked the authorities to intervene . Leaders of these organisations also met the Deputy Commissioner, Mr Prabodh Saxena, and handed over a memorandum, demanding a ban on the holding of the conference, which they alleged, was being done to entice the economically weak Hindus and convert them to Christianity. “We have received reports from many villages that Christian missionaries are roaming in villages distributing literature, audio and video cassettes, claiming the supremacy of Christianity over other religions,” alleged Dr Gulshan Kumar. Mr Nilender Gautam, state president of the Akhil Bhartiya Hindu Mahasabha, said that claims of curing diseases like cancer, blindness, AIDS and tumour with divine healing was mockery of science and medicine. Dr Gulshan Kumar, said since India is a secular country where one could preach his religion freely, they would have no objection if the conference was held in a church and not the Municipal Committee ground in Kangra town. The Deputy Commissioner, Mr Saxena, said that apart from looking into the legal provisions, the authorities would gather information about the likely impact that the conference would have on public order. Mr Tikender Pawar, spokesperson of the morcha, said the final voter list released here yesterday made it evident that the names had been deleted at the behest of the ruling party. A delegation of the morcha met the Election Commissioner and apprised him of the various cases of deliberate omissions and wrongful inclusions in the list. He said the morcha had pointed out at the start of the process that fake voters were being enrolled and the genuine ones were being left out allegedly in connivance with the Deputy Commissioner. In the final list names, which were deleted after objections, were included again. For instance in the Summer Hill ward the name of Sanjeev Kumar, serial No 848 which was deleted was re-inducted at serial No 1323. In gross violation of the rules the officer had wrongfully included more than 65 names in the list. Though the morcha had shown the relevant document regarding the actual proof of residence of the students still they were enrolled as voters. For instance Aman Mahajan (serial No 1280), who had been shown a resident of CPWD Colony, was actually residing in Tagore hostel, which was outside the municipal limits. Moreover, voters enrolled from 1278 to 1300 were non-residents and students of the university. Surprisingly the elected vice-president of university students union, who resides in a hostel outside the municipal limits, had also been enrolled as a voter at serial No 960. The morcha alleged that the manipulation of the voter list was part of the BJP’s game plan to rig the election. Speaking to mediapersons here today, she said the Deputy Commissioner, who was also the Returning Officer for the Shimla Municipal Corporation election, was not available in the office. Ms Stokes said no time would be left for scrutinising the voters’ lists as a large number of complaints of enrolment of fictitious voters had been received. She alleged that the people of Shimla were being misguided by the ruling BJP-HVC government and added that the employees had been badly hit by the recent Budget. A transfer policy should be there so that employees could have the feeling of security. She claimed that the Congress would come to the power with the majority in the local Municipal Corporation. She alleged that the government machinery was being misused by the BJP government. The PCC Chief, said four more activists of the Congress were expelled here today namely Mr Manoj Adhikari (ward No. 10), Ms Veenita Advocate (ward No. 11), Ms Paramjeet Kaur (ward No. 15) and Gopal Krishan (ward No. 12). Sinking their differences on the eve of the municipal corporation elections, the CLP leader, Mr Virbhadra Singh, and the PCC chief, Ms Vidya Stokes, today held their first public meeting together and sought votes for the Congress nominees to retain control over the civic body. Mr Virbhadra Singh and Ms Stokes shared the dais and will address another public meeting tomorrow at the sabzi mandi ground. Both leaders had jointly released the manifesto of the party yesterday at the PCC headquarters. Thakur Ram Lal, a former Chief Minister, who is also considered to be arch rival of Mr Virbhadra Singh, was also present at today’s rally. Mr Satyajitsinh Gaekwad, AICC observer for the elections, also addressed the meeting. He has been taking keen interest in forging unity in the Congress as the Assembly elections are due in February. Today’s rally was organised by Thakur Kaul Singh, MLA of Mandi district. A large number of people participated despite rain. Ms Stokes accused the BJP of having failed on all fronts and said it was a good sign that the youth had come forward to support the Congress. She said the Congress had taken a number of steps for the improvement of the town during the past 16 years. Mr Virbhadra Singh said the BJP had disappointed people who had been burdened with taxes. He said the Central Budget of the NDA government had put an additional financial burden on the masses. Mr Gaekwad criticised the BJP for creating a communal divide in the country. He criticised the Prime Minister, Mr Atal Behari Vajpayee, for his double speak on sensitive issues. He said no action had been taken against BJP leaders who were exposed by tehelka.com. Mr Dhumal said the people could not be misled by such gimmicks as they were aware that these leaders spoke one thing on the dais and were otherwise sending different messages regarding support to their respective candidates. He said the BJP was poised to win the election as the people were fed up of the 16-year rule of the Congress over the Municipal Corporation. The Congress did nothing to improve the civic amenities. What the BJP government did for the betterment of the town had been included as an achievement of its own by the Congress which released its manifesto yesterday. Moreover, the manifesto stated nothing for the betterment of the people, but had repeated “my” name in every sentence of the manifesto, Mr Dhumal added. He said he was hopeful that all irritants for the middle class in the Union Budget would be removed and added that many employee unions’ had pledged their support to the BJP because of the positive attitude of his government which did not indulge in victimisation of the employees and removed their grievances. Mr Dhumal said the tourists faced problems during the Congress regime as there was parking facility for only about 160 vehicles in the town. His government had now constructed 16 parking lots some of which were multi storeyed. 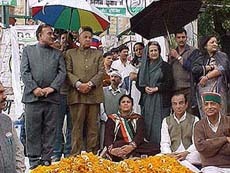 Mr Dhumal said these elections would be a referendum on the functioning of the Congress in the Municipal Council. The Congress leaders had been calling all previous elections and byelections a referendum and they were badly defeated. Addressing mediapersons here today, members of the National Democratic Party of Tibet (NDPT), Regional Tibetan Women Association (RTWA), Regional Tibetan Youth Congress (RTYC) and Students For Free Tibet, said that since the thirteenth year in a child’s life was crucial, it was important that the Panchen Lama, who happens to be the youngest political prisoner, be freed by the Chinese. The president of the NDPT, Acharya Yeshi phuntsok, said the Tibetans would appeal to Ms Mary Robinson, UN Committee on Rights of the Child, Chinese President Jinag Zemin and the Committee on Torture and Victim in Belgium, to pressurise China to release the Panchen Lama, who has been in under detention since May, 17, 1995. “Though we will pray for his well-being and safety, we are not even sure if he is still alive as China has kept the entire world, including US President George Bush and MS Mary Robinson in the dark about his whereabouts. “If China does not consider the Panchen Lama a threat to its regime, then why is religious head not being allowed to lead a free life where he can undertake his religious studies, as this is most important to him at this stage,” quipped Acharya Yeshi. He added that despite repeated queries about the safety of the Panchan Lama and his family, China had not given any satisfactory reply to any agency. Tibetan organisations will hold a prayer meeting at the main temple in McLeodganj and candlelight vigil. It was on May, 14, 1995 that Nyima was recognised as the 11th Panchen Lama by the Tibetan spiritual leader, the Dalai Lama. After taking him into custody within three days of his selection, the Chinese later appointed another boy as the Panchen Lama. They urged the world and the international community to support the unconditional and immediate release of the youngest political prisoner of the world. Col R. Kapoor, Centre Commandant, SC, a retired Junior Commissioned Officer (JCO) and a non-commissioned officer laid floral wreaths at the Regimental War Memorial. Wreaths were also laid on behalf of Major-Gen S.J.B. Sharma, VSM, the Colonel of the regiment. A mandir ceremony was also held on the occasion followed by Pagal Gymkhana and Meena Bazar. The aim of commemorating this auspicious occasion is to remember and acknowledge the sacrifices made by all ranks of the regiment of the Army and the nation both in war as well as in peace and to strive to not only maintain but improve the image and standards of the regiment. The history of the First Gorkha Rifles (the Malaun Regiment) is a fascinating account of the campaigns and battles fought across three continents since its raising in 1815. During the early 19th century, the Gorkhas from Nepal had extended their empire into the Kumaon, Garhwal and Kangra hills. This led to a confrontation with the British East India Company resulting in the Gorkha War of 1815. General Ochterlony was a witness of the highly skilled defensive battle fought with extreme bravery by the Gorkhas under Gen Amar Singh Thapa which ended with the siege of the history Malaun Fort located near Bilaspur. Impressed by the fighting qualities of the Gorkhas, the East India Company offered to raise a Gorkha Regiment from the remnants of Amar Singh Thapa’s Army after the treaty of Sigauli. Thus, the First Nusseree i.e. Royal Battalion came into being on April 24, 1815, at Subathu in Shimla hills, also the present home of the regiment. The devotional to duty of all ranks of this small regiment, of only five battalions, is embellished by the award of 31 battle honours, five theatre honours and three Chief of Army Staff unit citations. Over the years, the regiment’s personnel were conferred with two Victoria Cross, one Param Vir Chakra, six Mahavir Chakras, two Kirti Chakras and over 800 other gallantry awards. The regiment has provided two Lt Generals, 12 Maj-Generals and 20 Brigadiers to the Indian Army. At an emergency meeting of the union held here today, they alleged that they were being forced to work overtime against their will and the HRTC had withheld their dues amounting to Rs 6 crore. The union alleged that this step-motherly treatment was being meted out to drivers only. All other categories of HRTC employees were getting their dues. They said the drivers were working in “inhuman” conditions and the HRTC was “blatantly violating labour and other laws,” endangering the life of passengers. The Lambagaon police found the mutilated body of Meera Devi (24) hanging from a tree in a forest near Kosari, about 10 km from here, today. According to the police, she had been missing from her in-laws house since March 10. A complaint in this connection had been lodged by her father Jagdish Chand on March 12. A case under Sections 306, 498(A) and 34 of the IPC has been registered. The police has also arrested Mehar Chand, husband of the deceased, Kishori Lal, father-in-law, Brahmi Devi, mother-in-law, and Kanchana, sister-in-law. The post-mortem report of the deceased is awaited.